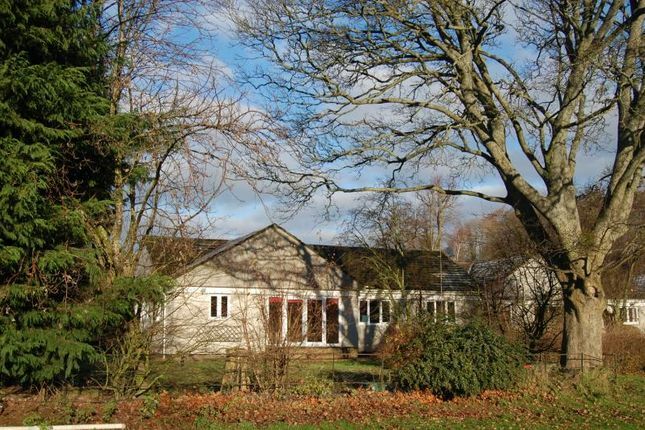 A modern and spacious detached bungalow positioned on a generous corner plot in a popular residential area of Stow. This attractive property offers three double bedrooms, integral double garage, landscaped gardens and the village will benefit from a new station on the Borders railway. Ground floor: Entrance vestibule, hall, sitting room, kitchen-dining room, utility room, WC, master bedroom with en-suite, two further double bedrooms, family bathroom. Outside: Private driveway with off-street parking, integral double garage, gardens with decking. The property is a modern detached bungalow positioned on a corner plot in a peaceful residential area of the village and within easy walking distance to the local amenities and to the new railway station due to open in the autumn of 2015, providing regular services to Edinburgh. The property benefits from UPVC double glazing and oil central heating. The village offers great links to the capital and enjoys a beautiful rural setting within the Scottish Borders. Stow has a village shop with post office, gallery with coffee shop, play group, bowling green, park, church and primary school with secondary and private education available in the area. The large Borders town of Galashiels is 8 miles away and offers the widest range of amenities of all the Border towns. These include an excellent selection of shops, supermarkets, schooling for all ages, and good sporting facilities. There are also a number of banks, restaurants and bars and the town is approximately three miles from the Borders General Hospital. Surrounded by miles of unspoilt countryside the property is only a few minutes' drive from the beautiful historic town of Melrose with its boutique shops, restaurants and hotels. The region is well known for its beauty and the lifestyle it offers and with both country and coastal pursuits on hand, the area is an attractive and enviable part of the country to reside.